[AAA] Fears. | there's no place like gnome. It’s getting real, folks. There are moments when I think, “I can’t wait to get on the road and drive to the last frontier!” but then there are moments when I think, “Holy sh**. 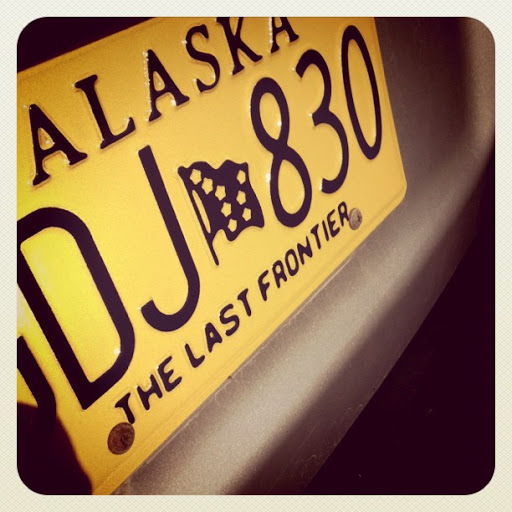 I’m going to drive to Alaska? !” I tried to find a companion but it looks like I’m doing it solo. Most of the time, I’m okay with that. [Honestly, the thought of sixty hours in a small confined space with one person – the same person – gives me hives. Curse you, introvert. How I’d ever be married and survive it I don’t know.] But sometimes, my mom sneaks into my ear and I worry that doing it alone is risky. I put official AK plates on Betty this morning. She’ll love the last frontier; I just know it. ← a wedding & a werewolf. Do you know how many kids days you are going to make? You are going to finish off a lot of games of Licence Plate Bingo. AK – NO WAY!